In the last blog in Myths, Mysteries and Mayhem I spoke about ‘McCarthy Gold’. To some extent this tale is myth or supposition, given that it wasn’t found historically, despite intense searching. It is definitely mystery. In this blog I will talk about a treasured religious artifact that does exist. It resides in the National Museum of Ireland, Dublin under lock and key. You can see it to the left on the back cover of the novel. This is a picture I took when visiting the National Museum in 2014. It is quite a container with gold, silver, precious moon stones and carefully formed figures of Christ, a Saint (potentially St. Columba) and animals in repousee on the outside. A handsome container indeed, made in 1084 for Cathbharr O Domhniall, the then current O’Donnell king, by Domhniall Mag Robhartaigh, the Abbott of Kells, at a monastery that St. Columba founded. 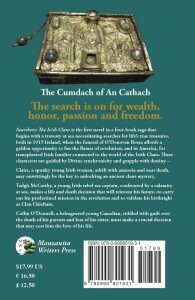 This Cumdach is one of the most revered relics of the Celtic period. The Cumdach was used by the O’Donnell Clan for ten centuries until 1602 when the British forces defeated the remaining clans. It mysteriously disappeared and only surfaced in 1840 in Europe when it was donated to the National Museum of Ireland. But what did it contain, and what were the mystical powers that together they commanded? And what, if anything, does this have to do with my tale of myths, mystery and mayhem. Read Searchers my dear readers. Click to get updates delivered right to your inbox.